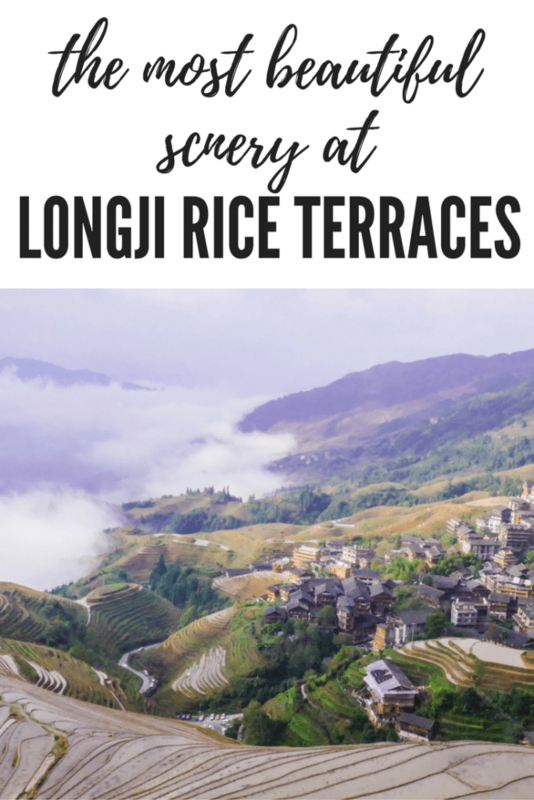 When researching for our trip to China, one place in particular caught our eye: the Longji Rice Terraces. 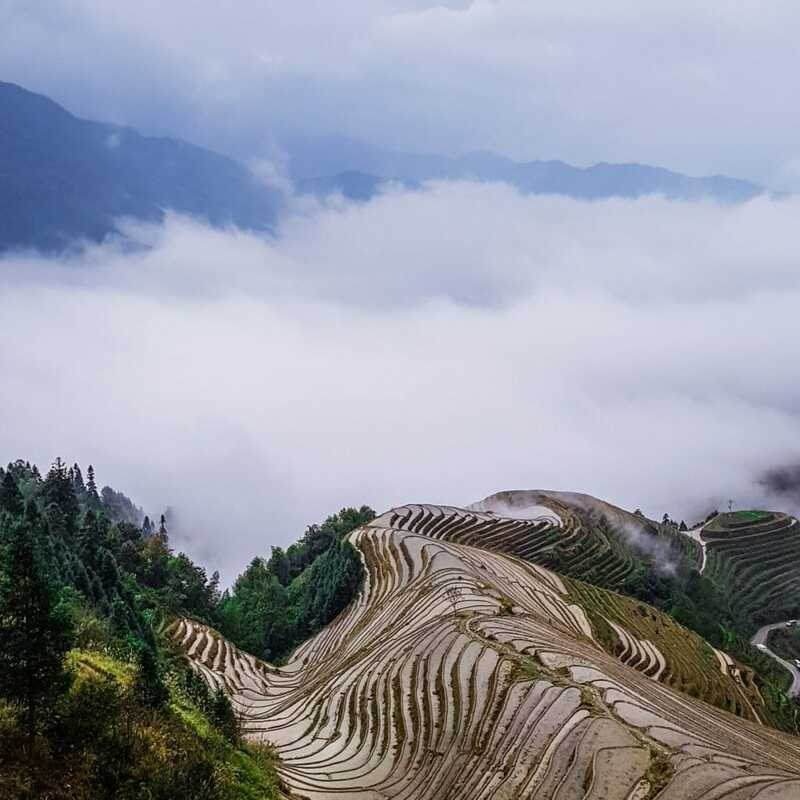 The Longji Rice Terraces are also known as the Dragon Backbone Rice Terraces as they’re said to resemble a dragon’s scales while the summit of the mountain range looks like the backbone of the dragon. Whatever you think they look like from up high, it’s easy to see why these are supposed to be the most amazing terraces in the whole of China if not the world. 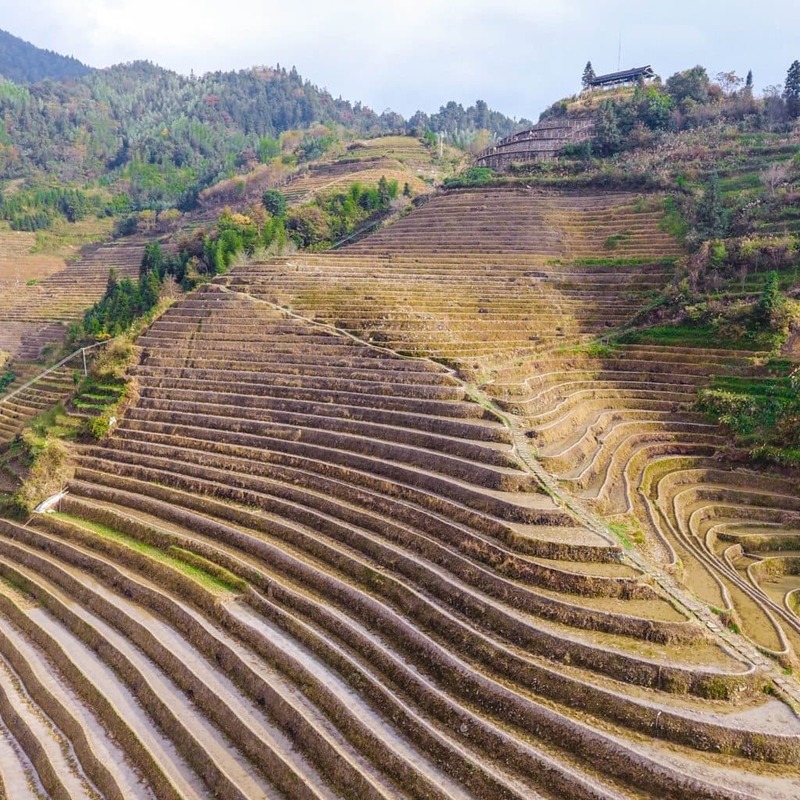 It’s extremely rare to come across rice terraces as big as the Longji Rice Terraces. With every corner turned and hill summited you’re presented with more and more rice terrace. Each is as beautiful as the last as they peek out of the clouds, reflect the sky in the pools or water and shine in the ever-changing golden light. Construction of the terrace began way back in the Yuan Dynasty (1271-1368) and continued into the early Qing Dynasty (1644-1911) when it was finally completed. You can only imagine how hard it must’ve been to get these terraces carved into the mountainous landscape. 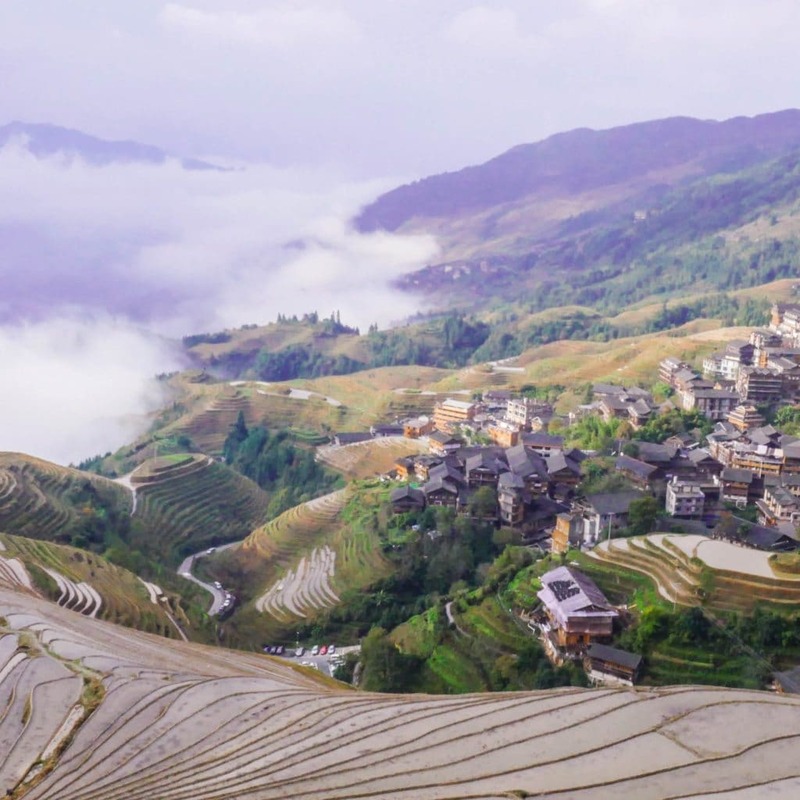 At 700 years old, the Longji rice terraces sure are looking great for their age. They’re carved into the mountainside looking down on Heping River and at their highest they’re 1,100m above groud. Rather extraordinarily they also cover 66km squared of land! That’s a lot of rice. What makes the rice terraces even more special is that they’re not just a tourist attraction. They are still in use to this day and you’ll see villagers going about the daily tasks of growing rice on your visit whether that’s weeding, ploughing or harvesting. It seems there’s always something to be done and it looks like a back breaking task! The terraces are said to be at these best during spring when they’re full of water. The water creates a pool in the terraces which then turn into mirrors for the sky above. But to be honest it sounds like the terraces are pretty spectacular whenever you go. In summer the green shoots spring up and and in autumn the rice terraces are golden and ripe for harvest before the snow comes in December. There was one month which seemed to be missing from many of these websites though. November. Yes, the time we’d be visiting was oft described as “not much to see” or forgotten about completely. There’d be no snow, but there’d also be no rice as it was after harvest. Given that we’d already committed to visiting the rice terraces we decided to stick to our plan and go anyway. So there might not be any rice, but it’d still be great to see China’s biggest rice terraces. We planned to forgo the tour group (you know how we roll!) 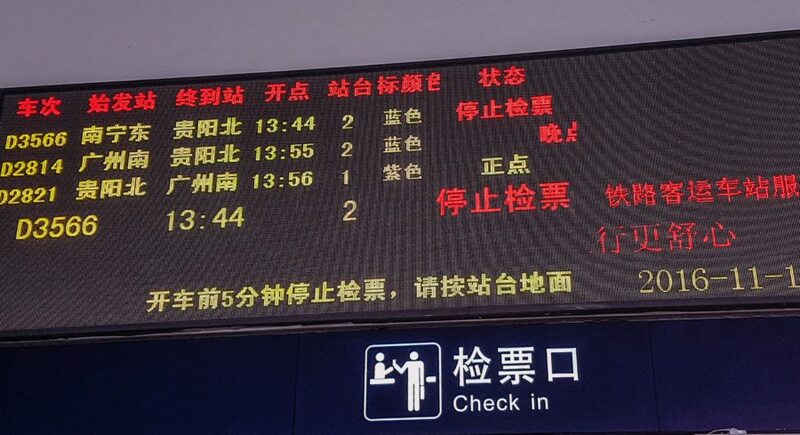 and travel to Ping’an independently. We’d booked a hostel for the night right in the middle of the village and couldn’t wait to gaze out at the terraces we were supposed to be able to see from our balcony as demonstrated on the booking.com images. Travelling there independently meant we had to figure out how to get the bus from the city of Guilin to the rice terraces themselves. This is not an easy task when you don’t speak Chinese and the locals don’t speak English. To make it even harder, Google and therefore Google maps, are blocked in China so that wasn’t an option either. Thanks for the staff at our Guilin hostel, we successfully navigated the public buses in Guilin. Turns out it’s not too hard. You just need to get to Guilin’s Qin Tan Bus bus station where we got on another bus towards Longsheng. We jumped off at Heping and transferred to Ping’An, the village we were staying in, in a minibus. As the only Westerners on the small minibus we drew a bit of attention but everyone was helpful. Whether it was the kind local lady trying to sort us out with accommodation (at her friends hostel of course), or the bus driver giving us his business card with the times the buses left from Ping’An to various other cities. Buses and taxis drop you off at the gates to Ping’An. From here it’s a pretty steep walk uphill into the village. Women wait at the gates donned in colourful and unique costumes which reminded me a little of the families on Lake Titicaca. 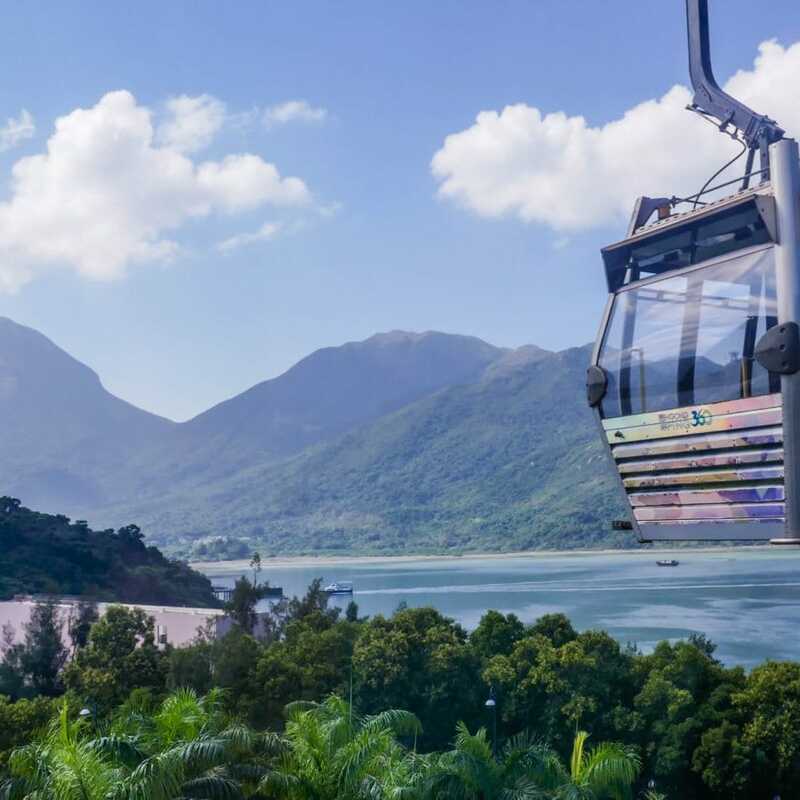 Their hair all wrapped up in coloured headscarves, they sit waiting for the busloads of tourists and, for a fairly small fee, will happily carry your bags for you once you’ve paid the 100Yuan entry fee to enter this special scenic area. 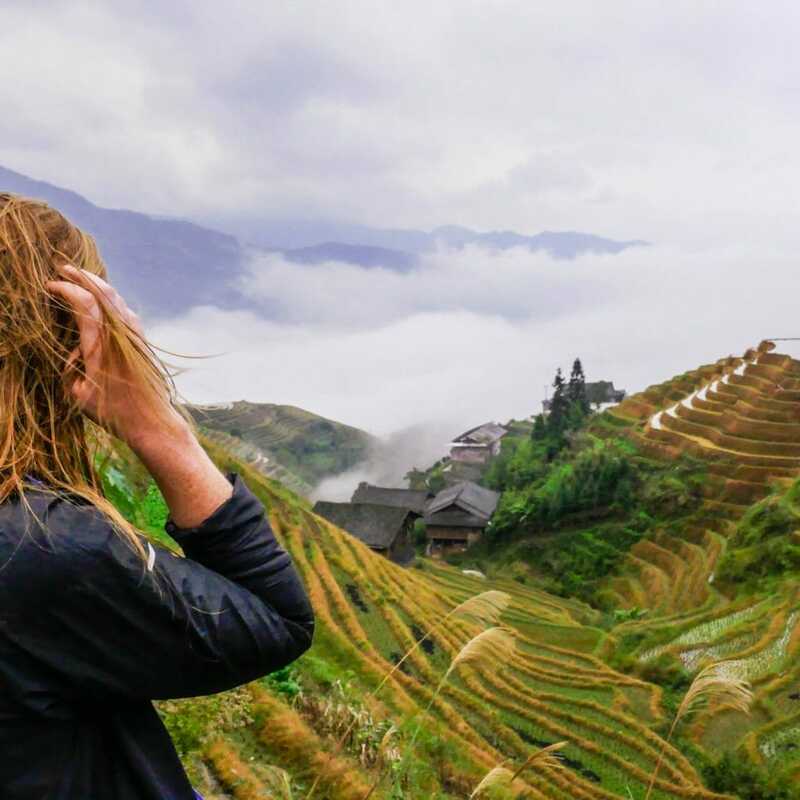 If you only have time to visit one village in the Longji Rice Terraces area then make it Ping’An. The terraces here were the first ones to be built and they’re the largest too. 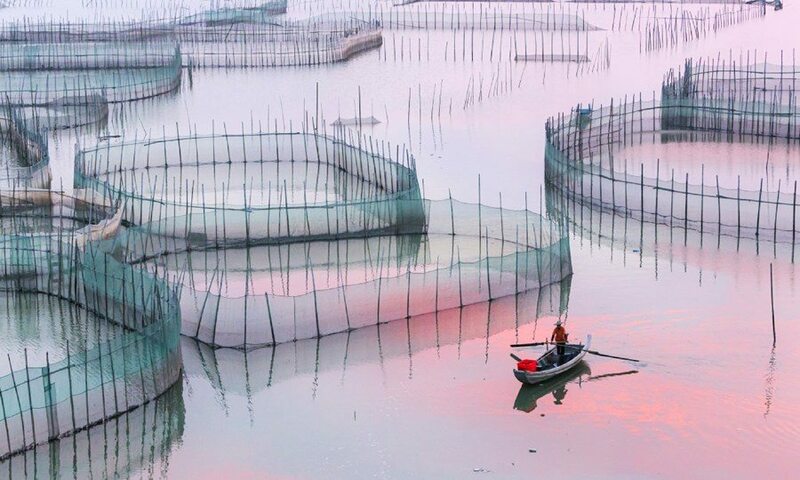 Because of this Ping’An is also the village that most tourists visit. But, on a misty evening in the middle of November, the village was virtually empty. We were the only two in our hostel and there didn’t seem to be much going on at the others we walked past either. Having been taken around the houses (quite literally) by the ‘kind’ woman on our bus who insisted multiple times that yes she was taking us to the hostel we’d booked, we finally found the real one. Breaking the news that we wouldn’t stay at the other villager’s hostel after she’d shown us to the door was a little awkward and we almost contemplating just saying yes given that the hostel hunt was getting increasingly harder due to the mist and encroaching darkness. Added to this was the fact that the only name we had for the hostel was in English and none of the locals could understand our strange words. When we finally got hold of some wifi and could look up the name in Chinese we were instantly pointed in the right direction. Upon arrival, our balcony view wasn’t quite how we’d imagined it. Everything was covered in mist. We could barely see the building next door, let alone the rice terraces we were assured were right next to us! When morning came we were relieved to find we could see the cloud had shifted slightly although we could see the clouds slowly rising up the valley. Where the cloud had shifted we were pleased to see the terraces and they were as gorgeous as we’d expected. So maybe they weren’t golden and ready for harvest, nor green having just sprung, but they were silvery thanks to all the rain of the past few days and they were tour group free – at least for the next few hours before the tour buses started rolling in! The three-story, dark wood stilted houses and narrow alleyways of Ping’An village were great to explore as we wound our way up through the village. Slightly out of breath as we climbed up what felt like hundreds of steps, we finally made it to the first of the two main viewpoints in Ping’An: Nine Dragons and Five Tigers. This viewpoint is so called as apparently the nine ridges of the rice terraces look like nine dragons branching off from the main vein. Alongside these are five tiger-like piles, guarding the peaceful village. I couldn’t quite see it myself, but maybe you will? From up on the ridge we had a fantastic viewpoint of the rice terraces below. The puddles in the rice terraces reflected the clouds above and there were a few people busy turning over the soil in their terrace in preparation for next year’s crops. We had the whole place to ourselves and marvelled at the unique landscape which was, like most of what we saw in China, unlike any other landscape we’ve ever seen on our adventures. 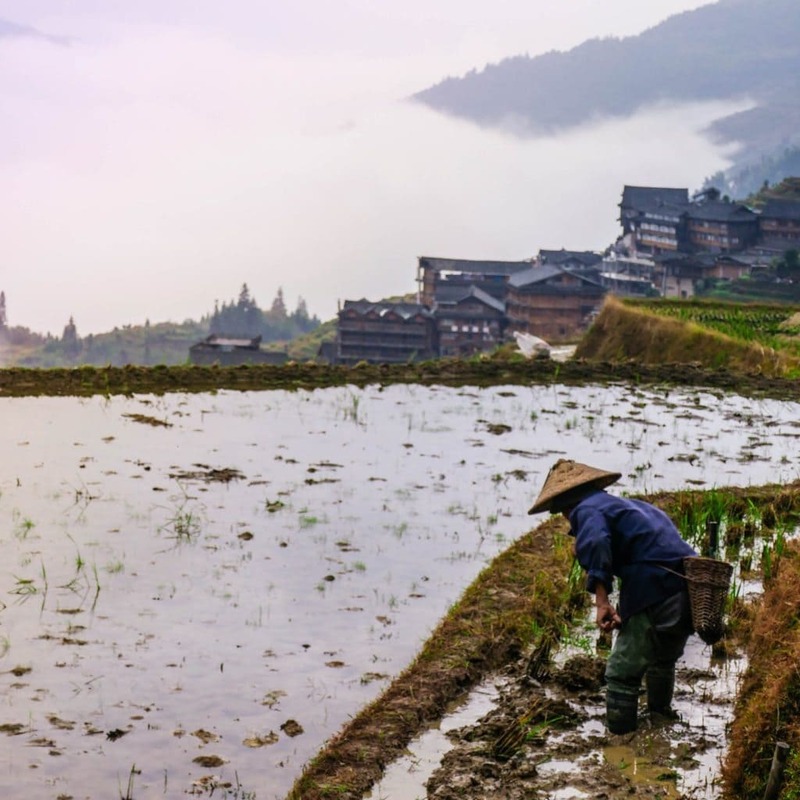 From Ping’an Village you can take a trek to some of the other villages that make up the Longji Rice Terraces or, if you’re short on time, just enjoy exploring this truly special village because one thing’s for sure: the Longji Rice Terraces are spectacular no matter what time of year you visit. 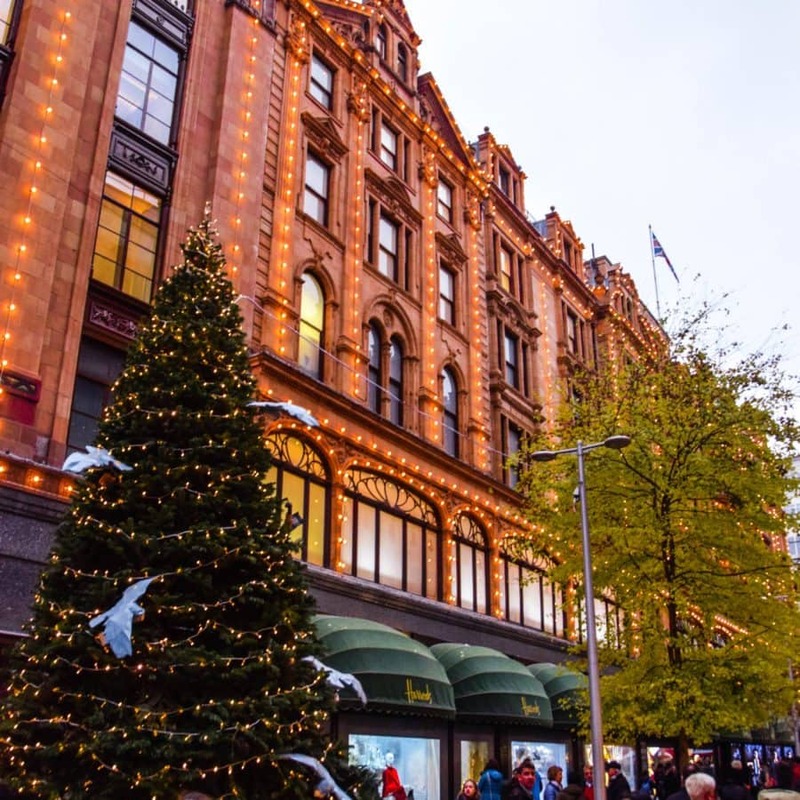 Travel independently to save money and, if you can, book a night’s stay in the village. It’s fantastic to wake up to the empty rice terraces before they get busy for the day. Remember to take plenty of cash as there aren’t any cash machines in the village and not many places will accept card as with most of China (unless you have a Union Pay card). Prices in the village are quite high due to its remote location so be prepared and don’t forget about the 100yuan entry fee per person. Oh, and don’t worry about what time of year you visit, I hope I’ve manage to show that it really doesn’t matter! What a spectacular view – truly unique scenery to have gotten to witness along with a very special culture. It’s great having had the privilege to travel here.